John Williams who is the president and chief executive officer of the Federal Reserve Bank of San Francisco published a letter yesterday explaining unconventional monetary policies. First I want to appreciate the clarity and simplicity with which John Williams is able to communicate complex ideas. His voice is honest, transparent and credible. What did he say? Primarily he said that unconventional monetary policy has been moderately effective and has its limitations. For example, the forward-guidance communication of the Fed has had problems by affecting outside bond rates. He acknowledges an error by the Fed. But at the same time, the Fed has been able to clarify the long-term outlook of the economy, which has helped business plan appropriately. Yet, his communication itself has a limitation. There is no way possible that he could project a recession. Even if he saw the possibility of a recession, he would not be able to mention it. How could forward guidance include a projection of a recession? The mere mention of a projected recession would create uncertainty that would undermine the markets. Let’s face it, recessions are part of the business cycle. Yet, I do not detect the slightest hint of a future recession in his words. Thus there is a large hole in his words. Wouldn’t it be better to acknowledge a future recession and then communicate a corresponding plan to ameliorate it? That would be a very honest and important issue to clarify. Nevertheless, he cannot go there. We need to realize that it is not easy to determine when a recession will start. The psychological factors themselves can hasten or delay a recession. The Fed has uncertainty about a future recession. John Williams who I respect tremendously projects an unemployment rate of 6.5% in early 2015 and that by the end of 2015, the Fed funds rate can start rising off of its zero lower bound. He views the natural rate of unemployment at 5.5%. He views the Fed funds rate rising through 2016 toward 2% by the end of 2016. Thus, he projects the economy getting back to normal by the end of 2016. Beyond that point, it seems implied that a recession is not a concern because the economy would be back to normal. Yet, his letter uses the words “new normal” in the title. He uses those words in reference to unconventional monetary policy. I will not read too much into that, but only to say that the economy itself may be in a new normal. He does not view the economy in a new normal, which would mean a much higher natural rate of unemployment. Yet, somewhere in his mind must exist the question whether the economy really has shifted to a new normal. On the outside, he disregards a new normal. But when Ben Bernanke asks at the start of meetings whether QE is working or not, the possibility of a new normal must be addressed. My sense is that the meetings end up disregarding a new normal that would mean a higher natural rate of unemployment. My research into effective demand shows a new higher natural rate of unemployment between 6.5% and 7.1%. My research is untested in real time because it is new. A higher natural rate of unemployment would mean that a recession is much closer than 2016. If my research turns out to be true, it would be a breakthrough in understanding recessions and the problems that are creating the current high unemployment. John Williams has a traditional and safe view of the future of the economy. Basically, he states that things will slowly get back to normal. Unconventional monetary policy will go away and only come back if things get rough again. His words induce certainty that the economy will be alright. But I am not buying it. He is leaving out some crucial factors. He never mentions the fall in labor’s share of income. He doesn’t offer an explanation for such low inflation and the steeply rising asset prices. He doesn’t even offer an explanation for the high unemployment. And yet he must know that the economy is demand constrained in the aggregate. He offers no explanations for these factors and only concludes that the economy is slowly getting back to normal. He seems to disregard that income inequality and a low labor share of income will have any effect. The economy will simply get back to normal, and yet its basic structure for distributing money has moved to a place far from normal. The IS-LM model is built upon two markets, the goods market (IS) and the money market (LM). The alternative view in this post will incorporate the effective demand limit into the IS-LM model. The money market is described by a plot of the interest rate (y-axis) and the quantity of money (x-axis). The line drawn is for money demand at a given level of nominal income, where nominal income (PY) is the real output multiplied by the price level (inflation). The money market model implies a corresponding and opposite bond market model. Graph #1: Source of graph, Department of Economics, University of Utah. As the economy grows, nominal income (PY) shifts right. Graph #2: Source, Department of Economics, University of Utah. In graph #2, money demand shifts right as nominal income grows from PY1 to PY2. If we hold the money supply constant, the interest rate will subsequently rise to the red dot. The excess money demand implies excess bond supply. Bond prices fall, thus raising the interest rate back up to the red dot equilibrium, where money supply is the same at a higher interest rate. Remember that nominal income can grow by increasing real output or by increasing the price level. Normally as the economy grows after a recession, nominal income growth occurs with just increases in real output, not the price level. Therefore during this part of the business cycle where there is less tendency for inflation, the Fed will be accommodative, and through their open market operations of purchasing “bonds” and increasing the money supply, they will keep the interest rate at the blue dot. The equilibrium points in this graph of the money market are plotted in the IS-LM model in order to give the LM curve. The LM curve gives the series of equilibrium points between the interest rate and real output. Graph#3: Source, Department of Economics, University of Utah. Graph #3 assumes that the Fed is not going to be accommodative, which is an unreal assumption. Therefore the LM curve should actually be horizontal in graph #3. The constant rate of interest of the LM curve is an induced equilibrium path by the Fed. Graph #4: Source, Department of Economics, University of Utah. Adjusted by me. So if the LM is horizontal when the Fed is being accommodative, when does the LM curve slope upwards? The answer… When real output reaches the effective demand limit. At this limit, real output will slow down and further increases in nominal income will show up as increases in the price level (inflation), not in real output. It is when the real output reaches the effective demand limit that the Fed stops being accommodative. Bond prices are allowed to fall raising interest rates. Graph #5: Source, Department of Economics, University of Utah. Adjusted by me. Graph #5 shows that the Fed keeps the interest rate low by being accommodative until the effective demand limit. It is assumed that the Fed will start raising the interest rate as inflation appears at the effective demand limit. The equilibrium points of the LM are currently moving horizontally with a constant interest rate. However, there is a complication. The Fed is expecting real output to reach $17 trillion (2009 dollars), while the effective demand limit is currently projected at $16.1 trillion. Thus the problem that the Fed will be inclined to keep the interest rate low beyond the $16.1 trillion effective demand limit. Graph #6: Source, Department of Economics, University of Utah. Adjusted by me. Graph #6 shows a scenario that the Fed keeps the interest rate low beyond the effective demand limit while inflation pressures begin to appear. Maybe they see the inflation as temporary, and thus don’t react to it. Or maybe unemployment is still above 6.5%. Or maybe the Fed is still deep into QE, not expecting real output to slow down and inflation to rise, and would need time to unwind QE first before raising the interest rate. Unwinding QE by slowing down purchases of “bonds” may be enough to control inflation by raising the money market interest rate. People would be more willing to save their excess money income instead of using it to purchase goods and services. The result would be less pressure for inflation. However, a result could be an economic contraction from slowing down the momentum of the economic growth. The goods market is described by a graph with aggregate demand (y-axis) and national output (x-axis). Aggregate demand is given by the consumption function which is determined from aggregate autonomous spending (A in graph) plus the marginal propensity to consume multiplied by national income (A + MPC * Y). Equilibrium (Y*) is found where aggregate demand (Z in graph) is equal to national output (Y). Thus a 45 degree line is drawn to determine equilibrium. Graph #7: Source, Department of Economics, University of Utah. As the economy grows, the consumption function will shift upwards for various reasons. Equilibrium output will rise along the 45 degree line. In a standard goods market model, a lower interest rate will shift the aggregate consumption function upwards as equilibrium level of real output increases. Currently the Fed has lowered their overnight Fed rate as low as they can in order to shift aggregate demand upward. But they are working against a fallen labor share of income which shifted the aggregate demand function downward. Be that as it may, the aggregate consumption function continues upward. What happens when the aggregate demand function reaches the effective demand limit? Graph #8: Source, Department of Economics, University of Utah. Adjusted by me. Aggregate demand and output will grow to the effective demand limit. At that point, output supply (Y) will slow down. As aggregate demand then grows faster than supply, the equilibrium point between demand and supply slides upward vertically on the effective demand limit curve (see crossing point of thick green lines). The excess demand will not be able to express in increased output as it normally would below the effective demand limit. The excess aggregate demand over supply creates pressures for inflation. Note: An excess aggregate demand over supply does not always lead to inflation, since there must be a mechanism to put that excess demand in the hands of consumers. If the excess demand ends up primarily in the hands of capital owners, there will be a bubble in assets prices instead of inflation for goods and services. Graph #9: Source, Department of Economics, University of Utah. Adjusted by me. The IS curve of the goods market becomes interest rate inelastic at the effective demand limit, unless there exists a mechanism somewhere to shift the effective demand limit to the right. Otherwise full-employment is reached at the effective demand limit. Note: As the IS curve goes inelastic at the effective demand limit, fiscal policy becomes ineffective. Thus, it is best to use fiscal policy for economic growth before the effective demand limit, like for instance, now…. Note: I could have made the IS curve horizontal before the effective demand limit as Keynes states that supply is perfectly elastic. However, the main idea is that the goods market becomes interest rate inelastic with full-employment at the effective demand limit. There will be pressures for inflation or bubbles in asset prices when real GDP reaches the “currently projected” effective demand limit of $16.1 trillion (2009 dollars). The Fed will be required to respond to control inflationary pressures. They will not be expecting real output to stall since they expect real output to continue up to $17 trillion. The Fed will have to respond by unwinding QE. Otherwise they will have price level problems. And the inflationary pressures depend on the momentum that real output growth carries into the effective demand limit. The momentum is economic, institutional, expected and generated. The greater the momentum, the greater the inflationary pressures. If the Fed was to slowly taper QE over the next year, they would control the momentum of real output going into the effective demand limit. The result in theory would be more manageable inflationary pressures. Yet, we see that the Fed has not wanted to start tapering yet in order to maintain the momentum of real output growth. If the Fed were to allow QE to run full force into the effective demand limit, the future will be interesting to watch. I don’t expect that to happen though. QE will have to be tapered some over the next year. Is there an inflation blowback coming from China? James Rickards wrote the book Currency Wars a few years back. (source video) He is supported by the Charles Koch Institute. He says the US wanted China to appreciate their currency, so that the dollar would depreciate, because the fed wanted to import inflation in order to meet their nominal GDP targets. His view is that the Fed is printing money and this money is going to China in the form of current account surplus, portfolio investment and hot money inflows. So then he says that China has to print money in order to soak up the dollars, mostly from exports to the US. He says that the inflation one would have expected to see in the US when the Fed was printing all that money was actually exported to China, because China was receiving those dollars, which had to be converted into Chinese currency since the two currencies were essentially pegged. He says that inflation has had a politically destabilizing effect in China for thousands of years. So at some point China will stop accepting the imported inflation from the US and appreciate their currency. Then the massive inflation that should have happened in the US will blow back to the US. So inflation in China is not high. There is price stability with managed wage growth. So I do not see the inflation in China that he is talking about. Now if the inflation in China has come down to 2.6% since 2011, then shouldn’t we have seen more inflation in the US according to his theory? But we don’t see it. The mechanism to transfer inflation through currencies that he is describing has not manifested itself. Does the dollar have to depreciate first? He would say yes. Will we see a depreciation of the dollar? Not much… As soon as the Fed starts tapering some time in the next 10 years year, the dollar will appreciate, but the Fed funds rate will still stay low. Why are economists like James Rickards supported, when their views are not based on sound assumptions? It seems they tell a story that is appreciated by those with conservative ideologies. The increased inequality of income, in the US and in China, is making it look like there should be more inflation, but economists don’t seem to realize that the bulk of consumption comes from labor. and the income of labor is weak in both countries. Household consumption is still below 40% of Chinese GDP. Labor share in the US has dropped 5% since the crisis. We are not going to see inflation under these conditions of weak labor income. Prices are maintained to correspond to controlled wages. Many people in both countries are struggling to meet expenses. Wages are controlled below a level where people could bid up a widespread increase in prices. Money is flowing, that is true. But it is not flowing among labor. Inflation depends on labor income and if output can keep ahead of it or fall behind it. There is no inflation that is going to blow back from China to the US. The days of that kind of thinking are gone. The economy has fundamentally changed. We are at a new normal. The real danger will come when real GDP hits the effective demand limit at around $16.1 trillion (2009 dollars) and the Fed thinks that real GDP should keep rising to $17 trillion. Then the Fed will keep pushing demand as output grinds slower. The increased momentum of demand will then have to be expressed in higher prices and wages somehow. However, if there is no mechanism to transmit that excess liquidity to labor and prices of household items, then there will be an asset bubble. The Fed will have to react and tighten somehow. They couldn’t just let a bubble get out of control. That would bring down demand and opportunistic behavior by investors… and with it the start of a recession. Do lower wages REALLY increase the natural level of output? Aren’t they missing something? One thing that is seen sometimes is a strange teaching in economics and business. The teaching says that lower costs of production will increase the natural level of real GDP output. Now the natural level of real GDP output is considered the limit at which the economy can produce. It is seen as the total productive capacity of the economy. The full-employment of the natural rate of unemployment is found there too. It is traditionally determined by looking at available factors of production at full-employment. Once real GDP reaches its natural level, output slows down and increased demand results in higher prices instead of more output. However, some schools teach and therefore many businessmen have it in their heads that lower wages, which are a cost of production, will increase the total productive capacity of the economy. A restriction on immigration reduces the number of workers available, and thus increases the cost of production (wages will be higher). The reduction in the required minimum wage allows firms to hire more workers at less cost. “In the long run, the investment will increase the economy’s capacity to produce, which shifts the LRAS curve to the right. Finally, it is likely that production costs will fall as new technology increases efficiency and reduces average costs. This means that the SRAS curve shifts to the right. The combined effects are that the economy grows, both in terms of potential output and actual output, without inflationary pressure. Here is a source that does a good job at explaining why lower wages would increase the potential output at the natural level… They show how higher wages and lower wages can increase the natural level of output. But this example still makes a critical error. Macroeconomics Principles, authors Libby Rittenberg and Tim Tregarthen. Behind these examples is a belief that the presence of a minimum wage will reduce the demand for labor, thus cutting people out of the labor force, thus reducing the numbers of people that will work, thus reducing long-run potential output. If we look closely in the above examples, we will see an error in understanding. They view the supply and demand for factors of production affecting long-run output, but they do not view the supply and demand for money used for consumption affecting long-run output. The examples above do not include the fact that if real wages are lower, ultimate demand for production will be lower. Thus, they see more long-run production, but they don’t see the reduction in potential consumer demand. All across the advanced countries we have been seeing a decline in labor’s share of national output. With this, we see a stagnation of real wages and an increase in corporate profits. Thus, the portion of output income that is given to labor to buy production is less. Do companies really think that lower real wages will keep long-run natural output from falling? Ultimately, at some point, weak consumer demand will be the limiting factor upon the long-run natural level of output. The effective limit of demand upon the long-run natural level of output is called the effective demand limit. It is a good idea to include an idea like the effective demand limit in the models for the long-run natural level of output. Even if inflation (CPI less food and energy) stays steady between 1% and 2%, there really is no problem. Prices are still rising. Paul Krugman would like to see inflation rise because that would lower real interest rates. But that is not going to happen, and he shouldn’t be expecting that it will. Is there a danger of deflation? No… Inflation will stay steady and low. But then, is there a danger of deflation in a subsequent recession? Yes, there is a danger, but prices will bounce back. The US does not have the same demographics as Japan. The problem in the economy is not inflation. Most Americans are just plain and simple not making enough money. So why don’t we have deflation? Business is providing goods and services at stable prices. Consumers don’t have the money to pull prices up, and prices have a strong resistance to go near zero percent inflation. Prices will remain stable. Is there a natural rate of inflation? In a previous post, I wrote about a natural rate of inflation. Does it really exist? What would it look like? We could understand a natural rate of inflation as the inflation rate at which the economy can most efficiently progress in terms of social benefits and costs. Some benefits are more employment, greater growth of GDP and lessening the burden of debt. Some costs are wealth reduction, business uncertainty and more price distortions. How could we determine a natural rate of unemployment? One way is to plot inflation (CPI, less food and energy) against unemployment. The cycle between these two variables is that as GDP is growing, inflation stays steady and unemployment is coming down. When GDP hits its natural rate at the LRAS curve, unemployment stops declining and inflation starts rising. The plot moves generally in a clockwise manner. However, since 1989, when unemployment stops declining and inflation doesn’t rise much at all. So in the following graph, we identify the points where unemployment stops. The graph is a scatter plot of unemployment and inflation (quarterly) from 1967 to 2013. The red dots mark the points where unemployment was when GDP hit its natural level. (See the arrows showing direction of movement in 1978.) Thus, the red dots mark the natural rate of unemployment. I included 2 points earlier than 1967. 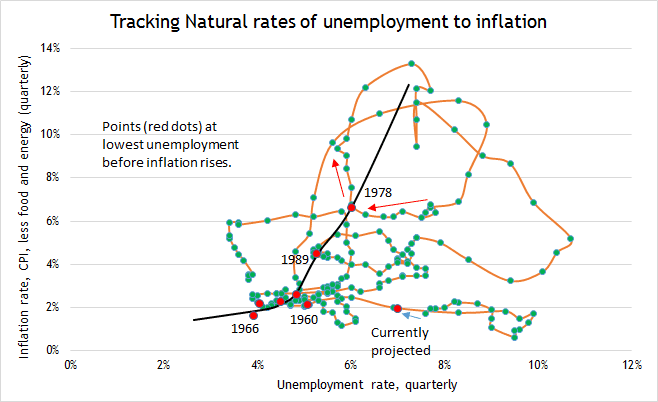 Roughly speaking the black line connects the red dots to show if there is a connection between the natural rate of unemployment and an inflation rate. The 7 points that we have before 2013 stay fairly close to the black line. What do we see? When inflation is lower than 3%, the natural rate of unemployment stays below 5%. If inflation goes over 3%, the natural rate of unemployment stays above 5%. that as inflation rises over 3%, the natural rate of unemployment tends to rise too. that 2% is the natural rate since most red dots occur there. that any relationship here is simply coincidental. I assumed in the previous post that as inflation dropped below a certain level that the natural rate of unemployment would rise. The graph is showing the opposite of what I assumed and what I understood from a quote by Joseph Stiglitz. So now look at the red dot labeled “Currently projected”. This is where I project the next red dot. Real GDP will meet its natural level at an unemployment rate of 7%. Most economists assume that unemployment will simply head back to where the rest of the red dots are. The difference is that I see the effective demand limit constraining unemployment at 7%, which never happened to the other red dots. The other red dots were always close to the effective demand limit. Can one conclude from the graph that there is evidence for a natural rate of inflation? Maybe. I will say that the economy seems to gravitate to an inflation rate around 2%. I do not think that Fed monetary policy is totally responsible for that. And having more inflation does not seem to ultimately create more employment. I am left with a sense that a range from 2% to 3% inflation is sufficient for the economy. Above 3% and below 2% does not seem ideal or necessary. One benefit from having higher inflation now would be that the debt burden would lighten for many who are deleveraging. But inflation is not going to rise to create this benefit. Inflation gets into a rut as it approaches the natural level of real GDP. To wrap it up… we need some inflation as a shock absorber for adjustments. We need some inflation to complement the momentum of output growth. And I can see why the Fed decides to kill the inflation that can develop at the natural level of GDP. It can be disruptive. Does targeting low inflation cause higher unemployment? Does targeting low inflation lead to higher unemployment? In other words, is it possible that a higher natural rate of unemployment is necessary to maintain a lower rate of inflation? Output and prices move together to maintain economic momentum. Normally output increases in response to demands in the market, which keeps prices stable. Yet, at those times when output cannot respond to the momentum of the market, prices will rise giving space for output to catch up. A higher natural inflation corresponds to when consumers have strong liquidity. A lower natural inflation corresponds to when consumers have less liquidity and are less able to drive the momentum of the market. When consumers have low liquidity, output finds it easier to respond to demands in the market, so price increases are less needed. The basic idea is that if prices are constrained from rising when there are inflation pressures from commodities or consumer demand, jobs will be cut short. Firms will not be able to maintain as much labor. The increased pressures from costs not being released through higher prices will cut into production possibilities. Thus, higher unemployment corresponds with a lower inflation target. Does inflation have a natural rate? This seems to be the key question. Unemployment has a natural rate. Even GDP has a natural rate. If you push unemployment below its natural rate, you get problems of economic over-heating. If you push GDP above its natural rate, there are risks of inflation and economic over-heating too. What would it mean if the natural rate of inflation for the US was 3%, and the Fed kept trying to push it to 2%? Here is an analogy. The natural rate of inflation is like a shock absorber on a car. You have bumpy roads where you live. So you have shock absorbers on your car that have a greater range of movement for the bumpy roads. When you keep your car speed commensurate with the conditions of the road, you have a comfortable ride. Then the roads all start getting paved and made smoother. Over time the shock absorbers stiffen, which creates a more stable ride on smoother roads. You can actually drive faster now too. But if you then try to drive your car on the old bumpy roads, you will have to drive much slower or get tossed around. A 2% inflation target is like paving the roads and streamlining transportation so that it can move faster with a more stable and smoother ride. But if the road ever gets bumpy, the tight range of the shock absorbers make you slow down much more on bumpy roads. A tighter inflation range restricts leeway in economic adjustments. The result from an economy going slower during rough times would imply higher unemployment. A higher inflation range would allow the economy to move faster on bumpy roads. An economy moving faster means lower unemployment. The relationship between inflation and unemployment is also found in the Phillips curve, where you have inflation on the y-axis and unemployment on the x-axis. The curve can be vertical or downward-sloping. If the curve is downward-sloping, like the right side of a capital A, then higher inflation would bring the unemployment rate down. But it is a tricky game with monetary policy. If the Federal Reserve sets an inflation target of 2%, and people really expect 2% inflation (Fed policy has credibility) and the inflation rate averages 2%, then people get used to the rhythm of the economy and the inflation target matches the speed. However, if the Federal Reserve was to set a higher inflation target and not tell anyone, people would feel comfortable even as the economy is moving faster. If the car is riding smooth, could the Fed slowly speed up the car without anyone really noticing and getting nervous? Could the Federal Reserve take advantage of stable inflation expectations? If the Fed tried to temporarily set a higher inflation target when the economy was moving smoothly, as soon as the economy hit some rough roads, the Fed would have to tighten more than if they hadn’t secretly been so loose and free. Some say this is what happened before the crisis. Is it possible that a higher natural rate of unemployment is necessary to maintain a lower natural rate of inflation? Yes it is possible. A higher rate of unemployment puts less pressure on inflation, thus making it easier to keep inflation low. Another way to look at this is… The Fed has been in a long-term plan to beat inflation down to 2%. By pushing the inflation rate lower for so many years, the economy has now shifted its institutions and dynamics into an equilibrium state of low inflation, which required a rise in the natural rate of unemployment to minimize inflation pressures. The flip-side of this issue, is that… If the Fed was to now target lower unemployment, they would have to accept higher inflation pressures. Yet, the economy is structured around very low inflation. and We all know the Fed has decided in favor of keeping inflation under control. The trade-off is higher unemployment, subdued wage growth and low demand pressures. So, to wrap up… the Fed has its 2% inflation stability, which is now projected to last for years. But the economy is needing more adjustment room from prices (inflation) in order to generate more economic momentum for output. More economic momentum for output would translate into more employment. The economy is needing a higher inflation target, but the Fed does not want to raise the inflation target, and even if they wanted a higher inflation target, they couldn’t achieve it, either secretly or openly. The economy is now stabilized at an equilibrium with lower inflation and higher unemployment. Whereas David Romer will say that the low inflation rate is a result of the zero lower bound. I would say that BOTH the low inflation rate and the zero lower bound result from the weak consumer liqudity due to very low labor share. I want to go deeper into what shapes inflation. I will refer to this equation during the post, but first, a look at inflationary gaps. Inflationary gaps define the top side of a business cycle, when real GDP is closer to its natural limit determined by the effective demand limit. It is called the inflationary gap because inflation was seen to occur with it, or at least that’s the way it was in the past. In the effective demand research, the inflationary gap occurs when capacity utilization is more than effective labor share. The downside of the business cycle is called the recessionary gap, but I might call it the anti-inflationary gap. Link to graph #1: Inflationary gaps past and present. In graph #1, the yellow dots identify the inflationary gaps, when capacity utilization (blue line) is higher than effective labor share (tan line). You can see that inflation (yellow line) increased after the peak of the inflationary gaps in the 1970’s. Inflation also fell in the recessionary gaps (anti-inflationary gaps). But inflation rose just a little after the inflationary gaps in the 1980’s, and barely at all for the last 20 years. Why did inflation stop occurring with inflationary gaps? The equation gives the optimal level of capacity utilization (cu*) at any moment for the economy. The independent variables in the equation are effective labor share (els), real GDP (Y) and a business cycle amplitude constant (a) in terms of real dollars. Since capacity utilization rises and falls through the business cycle, the optimum point represents the center of the business cycle, where capacity utilization is equal to effective labor share. If effective labor share is on balance above the optimal capacity utilization, capacity utilization will be over optimal. Thus, when labor share is too high for optimality, the implication is that the prowess of labor’s liquidity is greater than the prowess of firms to manage products. And inflation will tend to rise. On the other side, when effective labor share is below the optimal level of capacity utilization, capacity utilization will be lower than optimal on balance and firms will have the greater prowess to make the inflation tendency negative. In this situation, real GDP rises upon a lower utilization of capital and labor which manifests as high corporate profits. Labor share falls to a level which is not optimal for the economy, but corporate profits will rise. The lower labor share means lower liquidity prowess for consumers, and greater prowess of firms in an atmosphere of high unemployment. As labor and capital become under-utilized, a dead-weight loss to society develops. Link to graph #2: Optimal level of labor share. Optimal capacity utilization (brown line) has been rising through the years to currently around 88%. However, labor share has been falling. Effective labor share was above optimal in the 1970’s, which gave consumers the prowess edge in the market. The 1970’s was a time of positive inflation tendency. But ever since the 1980’s, effective labor share has been below the optimal level giving the edge to firms to control and subdue inflation. Effective labor share has fallen to around 74%. The rising of the optimum level of capacity utilization to such a high level indicates that the US economy has matured. The focus since the 1980’s should have been on distributing more national income to consumers, and letting the consumers save their money for investment. Lessons to learn… Now monetary policy is dead, but that is another issue. You can see at the end of 1990, that as effective labor share disengages from the optimal line, inflation begins to fall flat for years afterward. Comparing effective labor share to the optimal level of capacity utilization allows us to identify a period when inflation tended to rise, and the current era when inflation tends to fall. Inflation was more volatile when effective labor share was higher than optimal. Consumers had the power to purchase at higher prices and the dynamic was harder to control. But there are other problems now. So far we have looked at two factors that have affected inflation over the years. the inflationary gaps which used to have more effect. the optimal level of effective labor share which shows the shift in prowess from consumers (labor) to firms. But there is another factor, which adds more insight into the shaping of inflation… The natural rate of interest. The natural rate of interest is very helpful to have, if you can get it. The natural rate of interest that I calculate is for the center of the business cycle. To be clear, it is for the point in the business cycle between the recessionary gap and the inflationary gap. I could also calculate the natural rate of interest at the LRAS curve where real GDP hits the effective demand limit, but I want to focus on the inflationary and recessionary gaps in this post. If the economy was in balance at the point between the recessionary and inflationary gaps, then the Fed funds rate would theoretically equal the natural rate of interest to keep the economy in balance. During a recessionary gap, the Fed funds rate would theoretically be below the natural rate of interest in order to support the economy to recover from a recession. During an inflationary gap, the Fed funds rate would theoretically be above the natural rate to control over-heating of the economy and to control inflation. So what do we see when we compare the Fed rate to the natural rate of interest? Link to graph #3: The natural rate of interest and the Fed rate. The Fed funds rate is the green line. The natural rate of interest (center of business cycle) is the brown line. Back in the 1970’s and 1980’s, the Fed rate was always above the natural rate of interest, whether in an inflationary or recessionary gap. Such was the fervor to control inflation. During the 1990’s, the Fed rate stayed close to the natural rate, even as it rose to battle the double inflationary gaps in 1995 and 1997, even when there wasn’t any inflation to speak of. Since the 2001 recession, the Fed rate is spending much more time below the natural rate, so is the inflation rate too. You might notice that the natural rate of interest (brown line) mirrors the effective labor share rate (light tan line). The mechanism is as labor share rises, there is more liquidity for consumption, which gives consumers a greater prowess to raise inflation. The natural rate will rise to balance that effect and show that the Fed rate should rise a bit more to control that relatively positive inflation tendency. Link to graph #4: All variables in one graph. It is implied that if labor share was now at the same level it was at in the 1970’s, there would be less positive inflation tendency due to a higher level of optimal level of capacity utilization. Inflation moved below the natural rate of interest near the end of 1997, the same time that capacity utilization fell for good below its optimal level. In 2006 and 2007, the Fed rate was over the natural rate during the inflationary gap, which would have been normal in years past. However, inflation had hardly moved and the Fed looks to have over-reacted. The Fed could have kept the Fed rate lower and allowed a bit more inflation. Some criticize the Fed for being too tight. It depends on how you look at it. Currently we are in an inflationary gap, and inflation has been ticking down. Labor share fell first, but now labor share will stay steady. Inflation will most likely stay steady and rise a bit from here. There is not much danger of deflation. Just as the Fed rate stayed over the natural interest rate back in the 1970’s and 1980’s, the Fed rate will now want to stay below the natural rate due to a strong negative inflation tendency. The Fed rate will now be stuck on the zero lower bound, as long as the effective labor share stays so far below optimum. The inflation tendency will stay negative for quite some time it looks like. And what will happen to the natural interest rate that seems to be falling? It will stabilize around 2%. The variables in the equation for the natural interest rate are stabilizing. However, if labor share starts to rise again, the natural interest rate will rise too. If labor share falls even more, the natural rate would push lower, which wouldn’t be advisable. A lower natural rate would represent a really sick economy. I have been reading David Romer’s class notes called Short-run fluctuations. Part of his paper deals with a model to explain inflation in a liquidity trap. The model is based on real interest rates, output, expected inflation, Keynesian cross and IS-MP model stuff. I don’t see output falling like he describes. and How does he determine output’s natural rate? Does he use effective demand? His approach seems like the tail wagging the dog. I mean… I don’t think he is seeing the root mechanism of inflation. I don’t like his explanation. So what does determine inflation? Most have heard the standard definition of inflation… Too many dollars chasing too few goods. Let’s start here. This definition comes specifically from demand-pull inflation, but is used for inflation in general. Now imagine a cat chasing a mouse. If the cat is powerful, nimble and quick, the mouse will be caught. Now imagine dollars that are powerful, nimble and quick. Those dollars will catch the goods. Let’s say the dollars are so powerful, nimble and quick that even if you raised the price of the goods, the dollars can still catch them. You now have inflation. Now imagine goods chasing dollars. That’s right, goods now have the power, nimbleness and quickness to chase dollars. Goods are now the cat. But would this scenario lead to inflation? No… This scenario would lead in the opposite direction… to low inflation. The goods have the power to keep their prices low by way of luring and baiting the weak dollars into their trap. Goods have become the predator upon dollars and are optimizing their profits. Dollars are the money spent by consumers. Goods are the production of firms. The relative prowess between the two determines where inflation will go. If the liquidity of consumer dollars is more powerful, nimble and quick then the capacity of firms to manage production, you will have inflation. Dollars will compete for the products, which in turn raises prices. On the other hand, if firms are powerful, nimble and quick in managing their suppliers, production and distribution (like wal-mart), then prices will be kept low, along with wages. Goods will have the power to compete with each other for consumer dollars at low prices. But let’s look at cases when the liquidity prowess of consumer dollars is stronger. Higher wages (higher labor share) relative to production capacity in the 1960’s and 1970’s led to episodes of inflation. At the LRAS curve where we find the natural level of output, firms are constrained to produce more while labor increases its consumption dollars. Inflation tends to spike upward at the LRAS curve. Let’s look at cases when the production prowess of firms is stronger. Period from 1990 until the present. Real income has been lagging behind productivity. Labor share has been declining. This has given the edge to firms to be more nimble than consumers. Inflation has been trending lower over that whole time. The period following an economic contraction. Firms control production and the utilization of labor. Unemployment is up and wage growth is slow, while firms are re-employing their factors of production. Inflation is low during this time. It should be no mystery at the present moment why inflation is tracking low. Inflation tendency from the above equation would be less than 1. Firms have high profits, developed infrastructure, and access to capital. Consumers have low labor share of income and higher than normal unemployment. Total labor income is barely back to where it was before the crisis, while capital income has increased beyond that point. Firms are the current predator. If the Fed truly wants inflation, the Fed will find a transmission mechanism to increase the prowess of labor’s liquidity in relation to the firms’ prowess to produce. But I don’t think that is likely, because the Fed seems to be working for firms and not consumers. The Fed and the firms it represents prefer low inflation, but they have gone too far. We have had too much supply-side economics. Firms have become cats to all of us consumer mice. David Romer has the wrong liquidity trap theory for low inflation. Inflation is low not because of the ZLB liquidity trap, but because the weak liquidity of consumers is falling into the trap set by the powerful, nimble and quick firms. Effective demand model for monetary policy. Shows that low labor share is the cause of the persistent ZLB status of the Fed rate that David Romer says is the cause of low inflation. Post on low inflation. Shows a more detailed approach to explaining low inflation. An issue arose in the comments at a previous post, Labor share is chopped liver to Mr. Krugman. The issue is whether increasing employment in order to increase wages and labor share is a good strategy for fiscal and monetary policy. Dean Baker, Paul Krugman and others put forth this strategy. It seems common understanding that if the government could increase employment, that wages would rise and labor share would rise. But we have to broaden our scope of this strategy to see its eventual outcome. Keynes talked about output rising and employment rising until a point which he called effective demand. At effective demand, firms will experience maximum profits and they will not have expectations of higher profits. The effective demand limit establishes the LRAS curve for the economy. As real output reaches the LRAS curve, money increases in aggregate demand switch from increasing output to increasing prices. So normally inflation develops at the LRAS curve, as money increases in aggregate demand are diverted into higher prices and higher wages. Normally labor share will rise at the LRAS curve. Effective demand will increase with increasing labor share and a falling profit rate, but as effective demand increases a recession will eventually form. The business cycle does its thing. There are natural limits to output, employment and demand. Now, let’s look at a graph. 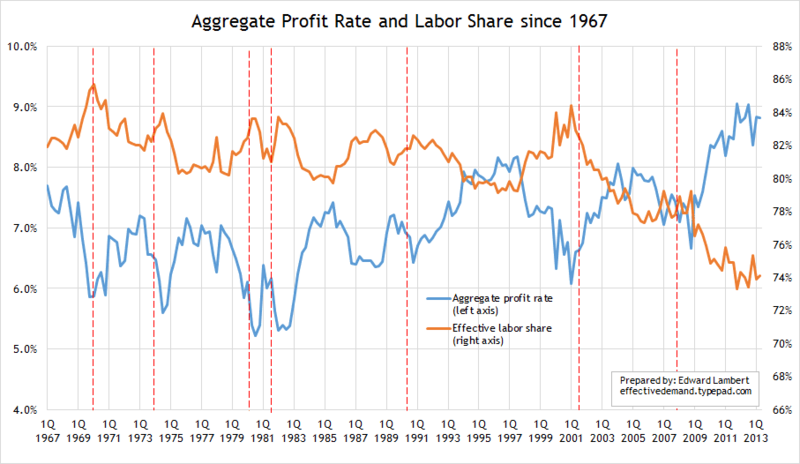 Link to graph: Aggregate profit rate and effective labor share. effective labor share = labor share index (business sector) multiplied by 0.766. It should come as no surprise that these lines mirror each other, because labor share of income is the flip-side of profits for capital share of income; normally in the form of retained earnings. But then we ask… is it a good thing to raise labor share through increasing employment? Well yes, because effective demand will increase, but you will see profit rates leveling off and then falling. and if you look at the red dashed lines in the graph which show the starts of recessions, whenever profit rates decline over time, you are heading toward a recession. So it is not smart to just let the free market increase labor share at the LRAS curve and expect the economy to keep growing into a wonderful future. By the time labor share starts to rise in the free market, profit rates will have leveled off, output will be nearing its natural level and effective demand as described by Keynes will be signalling an eventual recession. To say that a recession won’t happen because there will still be too much spare capacity to reach potential is to be naive with Keynes’ concept of effective demand. To be clear, the real problem I have with Dean Baker, Mr. Krugman and others is that they expect output to reach potential as projected by the CBO. They have rose colored glasses on and their optimism is just sure that employment will progressively snowball toward 6% unemployment, higher real wages and $17 trillion in real GDP (2009 dollars). But yet, effective demand will bite on profits way before that. In the long term, labor share will have to rise by 5% to get back to a normal healthy economy, but it will take a continuous effort through booms and recessions to get there. Let’s face it… we have fallen into a sub-optimal business cycle and a recession will come quicker than some expect. Note: 1987 was a recession for those like me who graduated into its job market. There were also global financial problems at the time.